Ed. Note- We continue our look back at 2014 with correspondent Andy Dougherty's Top-10 games of the past year. If you must know, Andy had all this stuff ready in late December, we were just too busy opening gifts and drinking eggnog to post it. Our bad Andy. Ghana had defeated the United States 2-1 in each of the previous two World Cups. The last loss, in extra time of the 2010 Round of 16, still stung. This time around, the Americans would turn the tables. Clint Dempsey started things off quickly, scoring within the first 30 seconds of the game, good for the fifth-fastest opening goal in World Cup history. From then on, the momentum gradually swung in favor of Ghana, who controlled the ball for 59% of the game and fired 21 shot attempts, compared to 8 for the United States. Ghana’s onslaught eventually led to the game-tying goal in the 82nd minute. But amazingly, the Americans answered right back with what proved to be the game-winning goal from substitute John Brooks in the 86th minute. 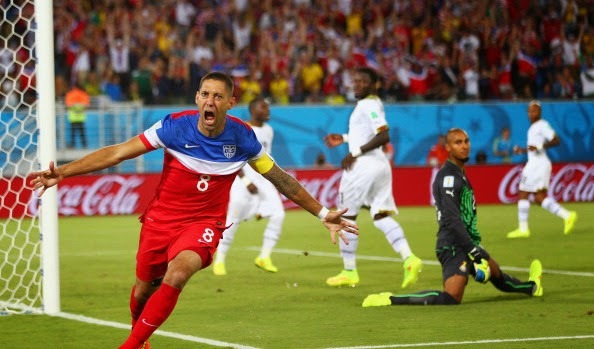 The win propelled the United States into the knockout stage of the World Cup and earned the team an ESPY Award for Best Moment of 2014. The only problem with this game was that it came in the second round. It pitted a perennial power in Kentucky against a relatively undecorated mid-major in Wichita State. But Wichita State was in the midst of its best season in program history. The Shockers actually became the first team in Division I history to finish the regular season with 30+ wins and no losses. But the Wildcats played a high quality game and took a late lead. Wichita State’s magical undefeated run ended when a late 3-point attempt clanged off the rim as time expired. Kentucky wound up reaching the finals, and Sports Illustrated named this the game of the year in all of sports. This was the only regular season game to crack the list, but it had a playoff-like atmosphere. Both teams knew that their championship aspirations would take a serious hit if they lost this game. TCU led after the first, second, and third quarters and appeared to be in control after a fourth quarter score gave the Horned Frogs a 21-point lead. But Baylor quarterback Bryce Petty’s sixth touchdown pass tied the game at 58 with 4:42 to play, and Chris Callahan nailed a 28-yard field goal as time expired to complete the comeback for Baylor. It was the highest scoring game between two Top-10 teams in the history of the AP Poll (since 1936). Check out highlights of this ridiculous comeback here. This was TCU’s only loss of the year, and it shut them out of the inaugural College Football Playoff. They showed that they were a championship team by routing No. 9 Ole Miss 42-3 in the Chick-Fil-A Peach Bowl, but it was too little, too late. This game went back and forth throughout, with each team taking control at various stages. The teams were tied fourteen different times in the game. Blazers’ forward Nicolas Batum knocked down a jumper to tie the game for the final time at 96-96 with 40 seconds left. Rockets’ Forward Chandler Parsons answered with a lay-up to give Houston a two-point lead with 0.9 seconds left. Then Damian Lillard took the ensuing inbounds pass from well outside the 3-point line and nailed the deep three at the buzzer to win the series. It was the first series-winning buzzer beater since 1997, when once again the Rockets suffered the heartbreak. Lillard’s series-winner also brought the Trail Blazers into the second round for the first time since 2000, ending the longest drought in the NBA. Whenever the United States faces off against Russia in an Olympic hockey game, it’s a big deal. Pavel Datsyuk scored twice for the Russians, and his second goal forced overtime. When neither team scored in the extra session, the game headed to a shootout. Datsyuk added another goal in the shootout, but then T.J. Oshie stole the show. Oshie had already scored to open the shootout, but Olympic rules allowed him to return after the third round for as many attempts as the game required. He matched Datysuk’s goal to extend the shootout. In the next round, he matched Ilya Kovalchuk’s goal to keep the Americans alive. Kovalchuk missed in the eighth round, opening the door for Oshie to clinch the game. He scored for the fourth time in the shootout to win the game. Russian President Vladimir Putin watched in disappointment from the stands, and Barack Obama congratulated Oshie after the game. This was the first winner-take-all playoff game to go 12+ innings in 90 years. The Royals took a 3-2 lead into the 6th inning when A’s designated hitter Brandon Moss sparked a 5-run inning with a 3-run homerun. The Royals still trailed 7-3 in the 8th inning when they began to rally. They scored three runs in the 8th, but their backs were still against the wall in the final frame. Jarrod Dyson made a bold play, stealing third base to set up the game-tying run, which he scored on a sacrifice fly. The Royals fell behind again in the 12th inning before Salvador Perez finished things off with a walk-off single. The win helped the Royals reach the World Series in their first playoff appearance since 1985. This match was the first Grand Slam final since 2012 to come down to a fifth and final set. It featured two all-time legends renewing one of the sport’s greatest rivalries on the biggest stage. Djokovic outplayed Federer early on to earn himself two set points, but Federer saved them and took the first set 9-7 in a tiebreaker. Djokovic then took control, winning the next two sets and jumping out to a 5-2 lead in the fourth. Federer saved match point with an ace and won five consecutive games to force a fifth set. After nearly four hours, Djokovic finally prevailed in what he called the best final he had ever been a part of. Behind incredible performances from quarterback Alex Smith and receiver Dwayne Bowe, the Chiefs built a 38-10 lead. Colts quarterback Andrew Luck also did more harm than good early on, tossing three interceptions. But he turned things around in the third quarter, finding chemistry with receiver T.Y. Hilton and mounting the second-largest comeback in NFL playoff history. Luck’s 64-yard bomb to Hilton gave the Colts their first lead of the game with 4:21 to play, and they held on to close out the win. The final stats of the game were just silly. Colts: Andrew Luck: 443 yards, 4 TD, 3 INT, 45 rush yards. Chiefs: Alex Smith: 378 yards, 4 TD, 0 INT, 57 rush yards. The Kings came into Game 5 with a 3-1 series lead, needing one more win to clinch the Stanley Cup. They took the early lead before the Rangers tied the game at 1. In the closing seconds of the 2nd period, Brian Boyle fired a wicked wrist shot past Jonathan Quick to give the Rangers a 2-1 lead. Marian Gaborik’s 3rd period goal tied the game at 2 and sent it to overtime. The Rangers had their chances to force Game 6, with a breakaway followed by a shot on a gaping net in overtime, but they couldn’t capitalize. The Kings finally cashed in late in the 2nd overtime when Alec Martinez’s goal clinched the Stanley Cup for the Kings. Auburn was the Cinderella story of 2013, bouncing back from a 3-9 season to win the loaded SEC West. They needed two miraculous plays to do it, beating Georgia on a Hail Mary pass and defeating Alabama on a 109-yard missed field goal return for a touchdown as time expired. Meanwhile, Florida State went undefeated, winning by an average of 42.3 points per game. But the Cinderella Auburn Tigers raced to a 21-3 lead by the second quarter of the championship game. Florida State steadily clawed its way back into the game and finally took the lead on a 100-yard kick return touchdown with 4:31 remaining in the fourth quarter. Auburn running back Tre Mason answered right back with a 37-yard touchdown, leaving Jameis Winston and the Seminole offense with 1:19 and a 4-point deficit. Kelvin Benjamin hauled in a touchdown catch with 13 seconds left to close out the biggest comeback in BCS Championship Game history. Here are the best moments from the frenetic finish.